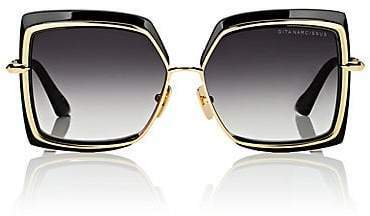 Crafted of polished goldtone titanium and black acetate, Dita's Narcissus sunglasses are equipped with UV-protective dark grey gradient lenses. 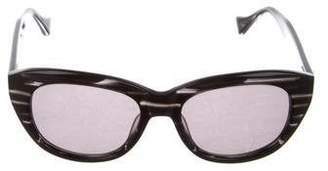 Made by master eyewear artisans in Japan, this statement-making frame is inspired by the oversized silhouettes of the 1980s. Logo at lens corner. Goldtone logo inset at temple tip. Oversized square shape. Nose pads. Shiny black acetate temple tips. Dark grey gradient lenses. 100% UVA and UVB protection. 58mm eye size. 14mm bridge size. 145mm temple size. Available in Goldtone/Black. Titanium, acetate. Made in Japan. Includes hard protective case and cleaning cloth. 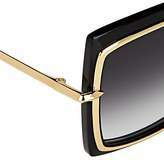 Dita Women's Narcissus Sunglasses - Black A great designer gift. Shop Dita at Barneys New York.